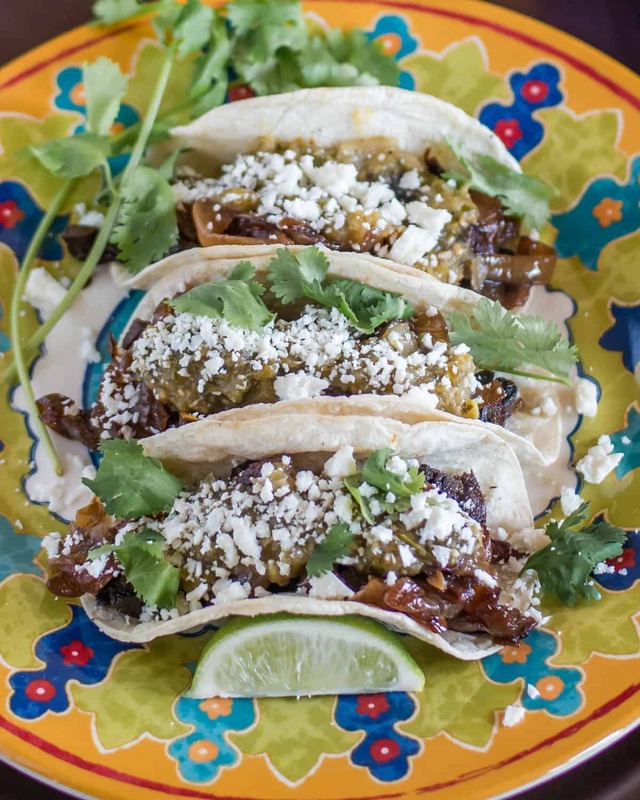 Lengua Tacos With Salsa Verde and Caramelized Onions? Yea or nay? An ultra fresh corn tortilla (tortilla de maiz) is stuffed with crispy diced and seasoned beef tongue (lengua), caramelized onions, salsa verde made with roasted tomatillos, Hatch green chile, onions, and garlic, crumbled fresh cheese and cilantro. Delicioso! Since moving to Texas’ Rio Grande Valley last summer, I’ve felt challenged and compelled to develop healthy recipes using the abundance of Mexican and American Southwest ingredients found here. I really do feel Mexican food has gotten a “bum rap” as less-than-healthy food. More often than not, our experiences with Mexican food in the U.S. are with fatty meats, melting cheese, and lots and lots of fried stuff. 😯 It doesn’t hurt to eat cheese and meat enchiladas occasionally, but I wouldn’t make a habit of it! The cuisine has so much more to offer! These delicious tacos came together rather quickly due to the fact that I cooked 2 beef tongues last week. I posted a lovely (in my opinion) recipe for Provençal Beef Tongue Sandwiches last week. Both of them weighed close to 3 pounds, and they’re boneless. My strategy was to make the sandwiches with long, thin sliced tongue, and then use the remaining pieces in tacos and a stew of some sort. Thus, this is recipe 2 of the 3 that I will eventually post. 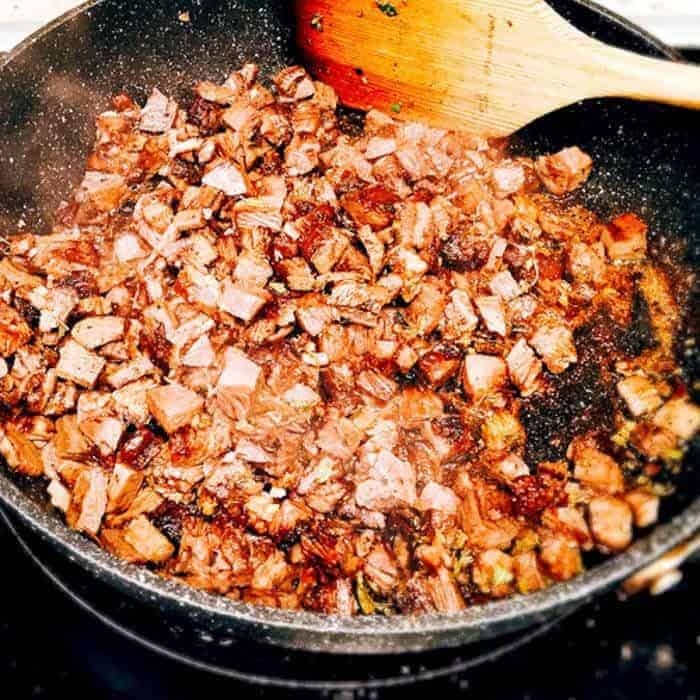 Once the boneless tongue is diced, it gets seared in a little coconut oil on high heat until crispy on the edges, and seasoned with Mexican oregano, ground cumin, and garlic. Pairing wine with Mexican food is still something of an enigma. We had a somewhat soft merlot with our tacos, and I would say it was just “okay.” I would stay away from anything with high alcohol and heavy tannins. Your best bet would be a dry or off-dry fruit forward wine with a bit of acidity. Sparkling wines can be an excellent choice with Mexican food. Do you prefer a craft beer? I would suggest a West Coast IPA with the tacos. The citrus hops pair well with the salsa verde and cilantro, and the bitterness cuts the rich tongue. Savory, crispy lengua (tongue) in a fresh corn tortilla topped with caramelized onions, vibrant salsa verde, crumbled cheese, cilantro, and radish. Hit one "out of the park" with this slightly non-standard but delicious taco! Preheat oven to 450 degrees (425 convection roast). Arrange tomatillos, quartered onion, garlic halves, and green chiles (if not already roasted) in a single layer on a baking sheet. Drizzle with olive oil. Place in the oven, and roast until nicely charred, about 30 minutes. Turn them halfway through. Add the whole roasted tomatillos and onions to the bowl of a food processor. Squeeze the soft garlic from their papery skins.Remove the stems, blackened skin, and seeds from the Hatch (or other green chile) if present. Add the garlic, green chile,cilantro, salt, and a few grinds pepper to the processor bowl. Pulse a few times until well combined but not pureed. Taste and season if necessary. If salsa consistency is too thick, add a little stock to thin it as desired. Set aside until service. Salsa will keep several days in the refrigerator. As soon as the salsa vegetables go in the oven, start the onions. Drizzle a couple of teaspoons of olive oil in a saute pan over medium-high heat. Saute until the onions begin to brown. Reduce heat to medium (if you're stirring occasionally). Stir with a wooden spoon occasionally. You want slow caramelization, not browning. When the roasting vegetables come out of the oven, the onions should be nicely caramelized. Add to a small oven proof prep bowl. Pop in the oven until ready to keep warm. Heat coconut oil on medium-high to high heat. You want some vigorous sizzling action. Add the diced tongue. Stir-fry until the edges begin to brown. Soften/warm your tortillas by your preferred method. See notes. To each tortilla, add a spoonful of lengua, a bit of caramelized onion, salsa verde, crumbled cheese, cilantro, and sliced radish. Serve with lime wedges for squeezing if desired. Having spent 22 years in Las Cruces, New Mexico, Hatch chile is always my preference. However, you can substitute poblano, anaheim, serrano, jalapeno. You can also substitute frozen diced or whole roasted chile. Use about 1 cup, and add to the processor bowl with the tomatillos. Make sure they're roasted, seeded, and peeled first! I like small pieces in my tacos. I diced the lengua in 1/4" to 1/2" dice. It's easier to eat and to keep the tacos from falling apart in a fresh tortilla. I like to heat tortillas on a hot skillet (comal). This can be tedious if you're cooking for more than 2 people. You can put them in the microwave in a tortilla warmer or wrap them in foil and warm them in the oven. For more on keeping tortillas warm see this link. 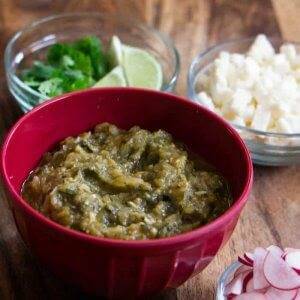 The leftover salsa verde will keep for several days in the refrigerator, but I'll bet it won't last that long! This recipe assumes you have already cooked tongue. For more on preparing tongue using a pressure-cooker (or other method), see Provencal Beef Tongue Sandwiches. Perfect for Taco Tuesday!!! One can never have enough taco recipes and this is a great one to add to my collection. Thanks! PERFECT!! This weekend I am so making tacos! Yay! I am not surprised that you'd enjoy Lengua Tacos :-) Have a great week Swayam! I normally stick to the same type of taco, but lately I have been trying to branch out and make different combinations. I don't know I am adventurous enough to try this one, but I do like the sound of the different flavours. I think you could substitute in chicken or a conventional cut of steak for the tongue! I never tried lengua. Very yummy looking recipe! Perfect for weeknight dinner! Ilona, you really should give it a try! The flavor and texture are quite nice. Have a great weekend! They look great, but I don't know if I'm adventurous enough to go for the tongue. However, if you sat that plate in front of me after a couple of margaritas I wouldn't be asking any questions about the cut of beef in the tacos. Haha! That's probably a useful idea ;-) I may try that if I make them for a party! These tacos look so delicious! I love caramelised onions! Caramelized onions are good on so many things Marsha! Have a lovely weekend! Funny - my co-workers and I were just talking about who eats beef tongue and I was the only one! I failed to convince them that it was delicious...seriously delicious. I've never had them in tacos though so I'm excited to try this one for use. Pinned for later! I adore Tacos, these look so delicious - I love the flavour combinations! Yum! Tacos are my favorite and we love to eat them at least once a week. 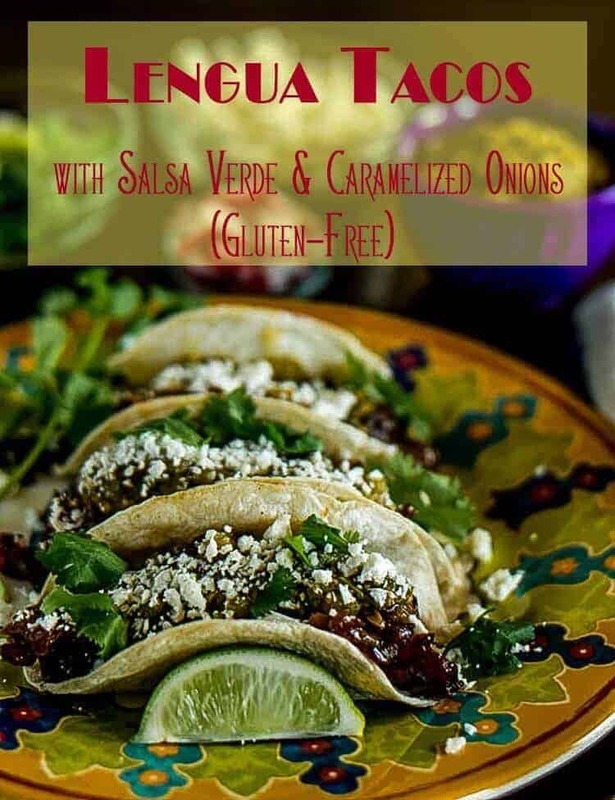 I'm adding these to our taco rotation, yum! Yay! You must be an adventuresome soul Jessica ;-) Thanks! This is pretty exotic. I need to give Mexican food a good try.